Just as a warning this review will contain a few spoilers. 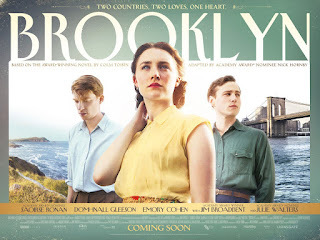 Brooklyn is about a girl called Eilis Lacey who is sent over to Brooklyn by a priest whom was asked by Eilis's sister Rose Lacey to send her there. The Priest gets her a job, place and helps her in her journey to America. Eilis finds it hard in the beginning with leaving her family and Ireland and It becomes all to much until she is sent to the priest who helps her out by sending her into a soup kitchen , in comes alot of Irish old men and is entertained by an Irish singer.During this moment tears gather in her eyes as she remembers what she left behind. Later she gets with a group of girls and goes to a dance where she meets a handsome Italian man called Tony. They dance and leave together after that the romance quickly follows with them seeing each other everyday resulting in them falling in love with each other.Eilis's happiness is short lived when she receives some terrible news on the death of her sister Rose. Grief stricken and sickened that she could not attend her funeral she tells tony she is going back to Ireland to comfort her mother. Tony is afraid she won't return to Ireland and asks her to marry him , she hesitates at first but then accepts his proposal. Back in Ireland , Eilis helps her mother and attends her mass , meeting her friend who tells her that she is engaged and wants her to come to her wedding. Eilis realises that she is going to have to stay a bit longer than what she told Tony. Coming home her mother asks her to help her sisters recent workplace out and when she does Rose's boss makes it apparent he wants her to stay and work for him which makes it harder for her to go back to Brooklyn. Hanging out with her friend she gets to know Jim Farrell and they start a friendship.Tony writes to her but only got one letter and later we realise she pushes them into a draw. Jim is very attracted to her and tries to persuade her to stay and tells her that he really likes her but she can't decide in which man and country she wants. On the whole , l really liked this film , l got transported back in time and l felt like l was Eilis, I experienced everything that she did, a real tear jerker. I loved the fact that you saw her begin as a very shy quiet person to a confident young woman who was very happy in herself. The scenery in the film was beautiful with the beach and countryside in Ireland and the city of Brooklyn. I adored the fact that most of the Irish people where played my Irish actors and actresses. I did however feel that some scenes were too long and that the last part of the film was very rushed with her coming back to Ireland and going back to Brooklyn. I also felt like at some points Eilis's character become a bit unlikeable especially when she was considering staying even though she promised tony she would come back but these were only minor complaints. I would definitely recommend for people to watch this film , it makes you think about what it would be like to move away from your family and friends into a new life.